Dragon Ball Z Side Story: Plan to Eradicate the Saiyans (Japanese: ドラゴンボールZ外伝 サイヤ人絶滅計画, Hepburn: Dragon Ball Z Gaiden: Saiyajin Zetsumetsu Keikaku) is a video game released for the Family Computer (Famicom/NES) game console in Japan. The game takes the form of a card battle role-playing game, where the player's movement and battle choices are dictated by the randomly generated playing cards. Multiplayer is a six player tournament using difficulty level of computer players that are in the save file. Players can choose between Goku, Gohan, Piccolo, Trunks and Vegeta. Winner records are kept in the game data, as well as any moves the player might learn. The Famicom game sold 300,000 units in Japan. 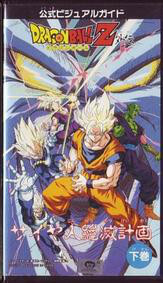 Dragon Ball Z Side Story: Plan to Eradicate the Saiyans was adapted into a two-episode original video animation (OVA) series directed by Shigeyasu Yamauchi and released on August 6, 1993 as strategy guides. In 1994, footage from the OVA was reused in a two-part game for the Bandai Playdia, True Plan to Eradicate the Saiyans, with some new scenes. Namco Bandai Games created a remake of the OVA in 2010 called Dragon Ball: Plan to Eradicate the Super Saiyans that was released with Dragon Ball: Raging Blast 2 for the PlayStation 3 and Xbox 360. Dr. Raichi (Dr. Lychee) is one of the only survivors of the Tuffles, a race that once lived on Planet Plant before the coming of the Saiyans. The Saiyans not only massacred the entire Tuffle race, but also stole their technology and conquered the planet, renaming it Planet Vegeta in honor of their king. Raichi managed to escape with a capsule and found refuge on the Dark Planet, a world at the end of the universe. His only wish is to eradicate the last remaining Saiyans. To do this, Dr. Raichi puts devices on Earth that emit Destron Gas and destroy all life. When Mr. Popo finds out that only a few hours are left until the planet's destruction, Goku, Gohan, Vegeta, Trunks, and Piccolo rush to destroy the evil devices located around the planet. They manage to destroy all but one that is protected by an impenetrable energy barrier. However, Freeza, Cooler, Turles and Slug appear and engage the heroes in individual fight. It is revealed by Kai-sama that the villains are ghost warriors, and will continually come back to life when killed unless defeated in the same way their lives were originally ended. The heroes track Dr. Raichi down to the Dark Planet and engage him, discovering that his ghost warriors are generated by a machine called Hatchihyack, a device powered by the hate of the Tuffles. It is also revealed that Dr. Raichi is a ghost warrior himself, generated by Hatchihyack. When Vegeta vaporizes Raichi, preventing him from re-materializing, the hate Dr. Raichi had causes Hatchihyack to exceed its limit. Hatchihyack appears in a powerful android body, whose power is said to match or perhaps even exceed Broly's, according to Goku. Hatchiyack devastates the heroes until the Saiyans, after having transformed into their Super Saiyan states, combine their powers together into one massive wave of energy, ending the threat of the ghost. The main villain from Dragon Ball Z Side Story: Plan to Eradicate the Saiyans. Hatchiyack is an android whose strength is fueled by the previously beaten villains' hatred for Saiyans. He comes to full power and materializes once Vegeta destroys Dr. Raichi, and is estimated by Goku to rival or exceed Broly's strength. He had many different forms in alternate endings, including a giant form, a multi form, and a super form. Dr. Raichi is a Tuffle scientist who wants revenge against the Saiyans and is the creator of Hatchiyack. He appears (slightly redesigned) in the special as well as its 2010 remake, Dragon Ball: Plan to Eradicate the Super Saiyans along with Hatchiyack, Frieza, Slug, Cooler, and Turles. The remake featured with Dragon Ball: Raging Blast 2 doesn't include Mr. Popo, the Monsters or Goddo Gadon. ^ "Dragon Ball Video Game Data". Dragon Ball 30th Anniversary: Super History Book. Shueisha. 2016. p. 216. ISBN 978-4-08-792505-0. ^ "その他 - TOEI ANIMATION". toei-anim.co.jp. Retrieved 29 August 2015. ^ "Saiya-jin Zetsumetsu Keikaku". daizex.com. 2010-08-15. ^ "Dragon Ball: RB2 Game to Add New 1/2-Hour Anime". Anime News Network. August 9, 2010. Retrieved November 10, 2010. ^ "Dragon Ball: Raging Blast 2 to Include Exclusive Dragon Ball Anime Episode". IGN. August 10, 2010. Retrieved December 16, 2010. This page was last edited on 16 February 2019, at 23:38 (UTC).